- Wm Shakespeare "Comedy of Errors"
Shakespeare's dialog appears in a scene in The Comedy of Errors where a stranger in town meets a woman who mistakes him for someone else, and he becomes enchanted by her beauty. 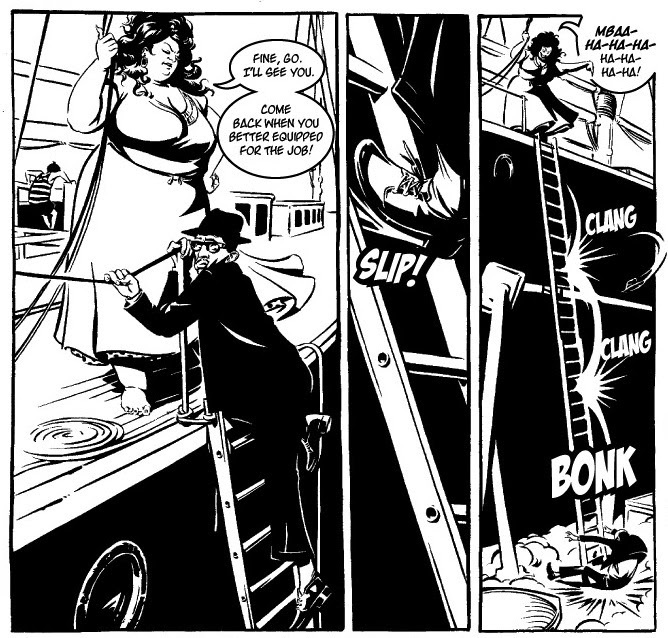 In Jonathan Case's graphic novel "Dear Creature" the stranger is an ocean-dwelling mutant monster and the woman is an agoraphobic spinster who lives with her sister in a dry-docked boat in a California seaside town circa 1960. Using a quote from Shakespeare is appropriate, since the sea monster, Grue, has a penchant for the Bard and speaks mostly in iambic pentameter. Giulietta attracts his attention by throwing pages of Shakespeare's plays packed into soda pop bottles into the ocean in a twist on the message in a bottle. Unfortunately for these sea-crossed lovers, more than just family stands between their happiness. Like many movie monsters, Grue has a hunger for human flesh, and it gets worse when pheromones are in the air. Both the art and the story are solid. Grue's dialogue in iambic pentameter seems appropriate for this monster. In counterpoint, Grue's chorus of crabs talk more like Damon Runyon. The family, Giulietta, Zola, Joe and Roberto, act as if they've lived together for years on the boat. 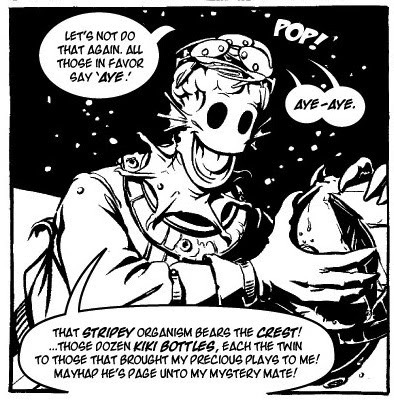 Characters that pop in for a page or two have distinctive dialog. Even the slightly wooden policeman Craw has a depth that we understand. He wants to marry Zola, but society of the time shuns woman who have been left behind by men. Case explores a plethora of early 1960s references. Characters mention Beach Blanket Bingo and go to the drive-in. Of course there are allusions to atomic bomb tests, and mutant monsters as seen in the movies. Giulietta and Zola's backstory explains that they were orphans in Italy at the end of World War II, and were whisked away to California by a rich suitor whose family made their money in soda pop. The black and white drawings work in many ways. They remind me of the black and white Universal monster movies. The shadows also carry enough weight to bring the story to life. Sometimes it's so dark, the panels seem be white on a black background -- with the image in relief like a woodcut. Case has some unique comic skills. An iconic male/female/harpoon symbol always shows up when men and women get together. This pheromone harpoon is often Grue's undoing, symbolically stabbing him in the brain and urging him into a blood lust. At these times Grue is truly a monster, and the icon is a neat way to bring attention to this violence. During a panel called "Composing Comics" at Stumptown Comics Fest 2013, Case talked about his craft. "Comics should be easier to read than not read." He felt the art should facilitate the story. Comparing repetitive panels versus clarity, he feels that repetition works for comedy. The third beat comes around and you have a surprise. Whereas action scenes should have a clarity -- a clear focal point improves and increases dynamics. He also mentioned he's a big fan of leaving areas of negative space. He compared the composition styles of Alex Toth with Wally Wood, referring to the latter's "22 Panels that always work"
"Dear Creature" is a lot of fun. The monster's face is stretchable and humorous. The puns, especially from the crabs are groan-able. And Case seems to especially enjoy the macabre humor that arises from the crabs wanting to feast on the remains of the teenagers killed by Grue, and Grue's unwillingness to face the facts. As a reader, I felt invested in the fate of all the characters. I wasn't disappointed by the conclusion. "Dear Creature" is Case's debut graphic novel. He has also worked on the "Green River Killer" and done a stint as artist on the recent Batman '66 from DC. His website is www.jonathancase.net. In “Hamlet,” Shakespeare uses a ghost to dramatize the young prince's internal struggle. The ghost of Hamlet’s father claims he was killed by Claudius, and urges Hamlet to take revenge. As the story unwinds, however, we find the ghost is unreliable and it seems to others that Hamlet is acting irrationally. 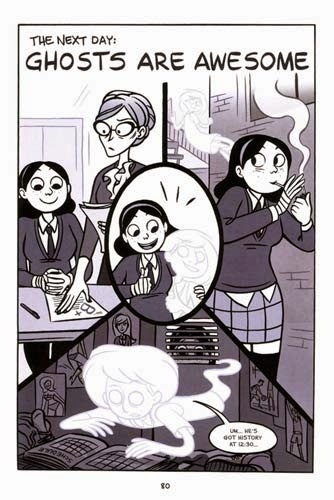 In “Anya’s Ghost,” Vera Brosgol uses a ghost in a similar way, as a friend, mentor and a danger for young Anya as she tries to fit in at high school. Anya's troubles start at home. Her family emigrated from Russia to the US when she was five, and she has worked hard to lose her accent and look like an American girl. Unfortunately, her mother feeds her heavy Russian foods, makes her go to church, and encourages a friendship with Dima, a nerdy Russian boy who goes to the same school. Anya has one friend, Siobhan, but their friendship is based more on cutting class and shared cigarettes than on shared interests. After they have a disagreement Anya storms off to smoke in the woods. Unfortunately, she falls down a well and discovers not only a skeleton, but Emily, the ghost of the bones. Although at first Anya is petrified, but after she escapes from the well she and Emily strike up an uneasy friendship. The theme of ghosts, whether literal or symbolic, weaves nicely through this book. At first the ghosts of the old country, embodied by Dima and Anya's mother, seem to be holding Anya back, but then she realizes she appreciates and loves them. Brosgol was born in Moscow, and it seems she has put some of her own experiences into the story. "Anya's Ghost" also explores what it means to be a teen, both 100 years ago and today. It asks whether there is a schedule for falling in love, getting married, and taking on responsibilities. Emily's ghostly origin provides a mirror for Anya to reflect on her own feelings and path. Best of all, this is a ghost story, and at times it becomes genuinely scary. Much more effective than a shocking surprise in a movie, Brosgol provides some psychological terror, which is effective no matter what age, young or adult. The result is truly haunting. I saw Brosgol talk about her book several years ago in Portland. She says that inking is her favorite part, and it's evident by her clean, dark, lines. (You can see a presentation of her process here.) She spent three years working on "Anya's Ghost" and the beautiful black and white with shades of lavender result is worth it. According to her talk, she likes to focus on the expressions. She has a mirror at work, and even if she's not looking in the mirror she's making the face of the character she's drawing. Like many artists, her day job takes priority over personal projects, and drawing at work uses the same part of her brain. Her real passion is telling her own stories. The problem us just that she's chosen an inefficient method of telling stories. At the time she was working on a revised version of a web comic she did in high school called "Return to Sender."